What version of Enterprise Architect was used in this presentation? Enterprise Architect 14,1, Build 1428. How can I contact Sparx Services North America for training and consulting engagements? For more information, see the Sparx Services North America website, email sales@sparxsystems.us, or call Toll-Free: +1 (800) 882-6051. Will you send us the slides from this session? Yes, they are available on this page under Webinar Demonstrations and Resources. 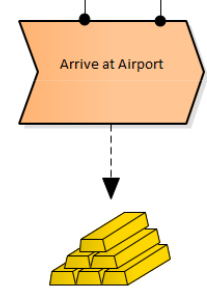 How do you create those customized icons like the gold bars shown in the airport model? Can you define a stereotype and allocate an image to it? You can use alternative images to represent UML Stereotype or model element. For details, see the Help topics on Alternate Images and the Image Manager. UML elements and connectors each have a standard appearance, in terms of shape, color and labeling. It is possible to change the appearance of a type of element or connector in a number of ways, using a Shape Script to define the exact feature you want to impose on the default – or main – shape. For details on creating your own Shape Script, see the Help topic Getting Started With Shape Scripts or the webinar on Extending Enterprise Architect. What models should be used to cover business/enterprise architecture? The webinar discussed a variety of models to represent business or enterprise architecture, including UML, BIZBOK®, ArchiMate® Specification, TOGAF® Standard, BPMN and many more. For a comprehensive discussion of Enterprise Architecture, see the Agile Enterprise Architecture web page. Where can I find out more information about BIZBOK? A Guide to the Business Architecture Body of Knowledge® (BIZBOK® Guide) provides an industry standard framework for business architecture practitioners who wish to use business architecture to address business challenges. The BIZBOK® Guide was used in the airport model to describe everything from corporate strategy and Capability Maps through to Value Maps and stakeholder value. SCRUM is arguably the most popular agile framework, is there any support for that? What I missed in all the tools currently available is the connection between a solid modeling tool (mind mapping, data modeling, business process modeling) and SCRUM process (events, team, stories, impediments). SCRUM is an agile framework for managing knowledge work and software development. Part of the webinar examined tools like Burndown Charts and Kanban diagrams that can be used to manage aspects of sprints, daily stand-up meetings and general resource management. Other topics were not covered in detail due to time constraints. We also looked at User Stories and building documentation from reverse engineering. Chris also spoke about achieving business agility through understanding business motivations, modeling factors that drive business and building a coherent strategic plan. Tools from Sparx Systems – Enterprise Architect and Prolaborate provide the ability for users to adapt the tool to any development methodology. Enterprise Architect allows custom profile definitions and there are a number of Agile based profiles available in the community. Sparx Systems Prolaborate facilitates dashboard creation to keep track of the user stories, sprints, burndowns, backlogs and test cases. Thus a combination of Enterprise Architect plus Prolaborate could be a good fit to bridge the gap between Agile tools and modeling tools. For details, see the Help topic Scrum and Support for Agile Methods. Are there additional webinars that cover the Pro Cloud server and WebEA? Yes. You can view past webinars from our Webinar Library. Some popular webinars on the Pro Cloud Server include Setting Up Pro Cloud Server for Enterprise Architect and 6 Steps to Socialize Enterprise Architect Models. Can WebEA be configured to restrict access to only show sections of the repository to different teams and clients? Depending on which type of database is used for the model repository, you can use the Visibility Levels feature to restrict or hide parts of the model. For more information on Visibility Levels, see the Help topic Visibility Levels. Can users only view a model though WebEA or also edit it? For example, is it possible to create diagrams. Users can edit the model with WebEA by creating Packages and elements and updating their properties, but editing of diagrams is not currently supported by WebEA. For details, see the Help topic WebEA Quick Start Guide. How do you create those Navigation Cells that point to other places in the model? When you drag one diagram onto another, Enterprise Architect automatically prompts you to drop the diagram as a standard text hyperlink. One of the options includes a Navigation Cell. Using a Navigation Cell is ideal for models viewed in WebEA, as it makes it easy to navigate your model on a Tablet, mobile device or web page. 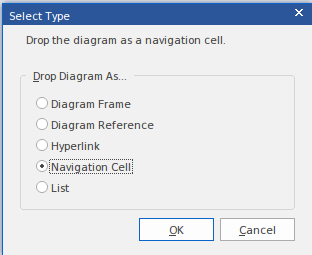 For details on how to create a Navigation Cell, see the Help topic Add Diagram Links To Diagrams. What links or integration exist between Sparx Enterprise Architect, Pro Cloud Server and other tools? The Pro Cloud Server family now includes a new modular integration capability that is tightly connected with Enterprise Architect. For more details, see the Help topic Integrate Data from External Providers. How can I calculate ROI of business architecture efforts? 10 people x 3 days x 8 hours/day/person x $50/person/hour x 20 times/year = $240,000/year spent just on impact analysis. Then when you couple that with the uncertainty about the confidence of the planning efforts, it's not unusual to find that we still miss things, which surprise us late in the lifecycle and at that stage are often expensive risks to resolve and result in additional rework. A more strategic perspective is to consider the risk of not doing Business Architecture and the historical evidence you can point to where, if effective Business Architecture had been in place, you might have been able to deliver better outcomes (better solution, less money, less time, lower risk, etc). If we think of this the way many people manage (or do not manage) their retirement portfolio, sometimes you get lucky making uninformed decisions, but usually you do not. You consult professionals with specialized skills, training, and experience that empirically evaluate your portfolio and provide recommendations based on your strategy. Why would we want to not manage our transformation investments in a similar fashion? Again, maybe you'll get lucky, but anecdotal evidence suggests that is a pretty capricious risk management philosophy for delivering strategic initiatives. For more details, see the Help topics on Types of Architecture and the Characteristics of Good Architecture. How do I organize User Stories into Product Backlog / Sprint Backlog. How do you break them into Tasks as JIRA and AzureDevOps offer? You can use the multi-stage Kanban diagram pattern for assigning User Stories first to a Product Backlog and then promote them to a Sprint Backlog to assign them to a specific sprint. For details, see the Help topic MDG Technology for Kanban. Create Task elements as child elements for each User Story element. For more information, see the Help Topic on the Maintenance Diagram. Create Task elements as elements in their own package, possibly one package per sprint, and trace the Tasks to the User Stories using Relationship Matrices. For details, see the Help Topic Relationship Matrix. Use the Construct view to define tasks and allocate them to individuals. For details, see the Help Topic Task Management. Use the Maintenance views to define tasks. Is there support for Story Point assignment to User Stories? You can manually add a ‘Points’ Tagged Values to a User Story. SSNA has implemented an extension to the built-in Kanban diagrams for Agile development teams that includes this and other features. Please contact SSNA at sales@sparxsystems.us if you’re interested in more details.